Holy Jim and Trabuco cabins are recreational homes located in the Cleveland National Forest in Orange County, CA. (this FAQ also applies to forestry cabins located off of Ortega Highway within the Cleveland National Forest at Hot Springs Canyon Rd). The cabins themselves are privately owned, but are located on Federal government land. Those that are for sale are often listed on the MLS under Trabuco Canyon. Because they are off the grid, the cabins are classified as personal property, and therefore do not qualify for standard real estate financing (a mortgage). Buyers typically have a barrage of questions about these cabins, so I have answered many of these questions on this page. Are you interested in buying a cabin? Check my list here: Cabins for sale There may be additional cabins for sale also. Call me for details. What is a Forestry Cabin? These cabins are in the canyon near Trabuco. Are they similar to cabins and homes in Trabuco, Modjeska, and Silverado Canyons? No. These are cabins in the Cleveland National Forest. They are completely different from homes in Modjeska, Trabuco, and Silverado Canyons, which are properties located in the County of Orange. Properties in Orange County have access to utilities like water and electricity, plus phone lines. They are also considered regular real estate and therefore qualify for financing through standard mortgage sources. Forestry cabins are on Federal land, not County of Orange. They are also considered "personal property", not standard real estate, so they do not qualify for normal mortgage financing and are cash-only purchases. They also do not have access to public utilities. Why are the homes NOT for full time occupancy? Because it is in a National Forest. You are not allowed have your primary residence in the National Forest. The forest is for vacation and recreation, that is why the cabin is a recreational home, not a primary home. You must have a primary residence elsewhere in order to qualify for the forest permit. How long is the permit and what is the fee? The permits are for 20 years. I believe that for a re-sale, you would pick up the remaining term of the existing permit (i.e.,18 years left and you take over). At the end of the permit, you can renew for another 20 years with the Forestry Dept. There is an annual fee and the amount varies by cabin, but it is relatively low cost. What kind of people live out in the canyon? Regular, normal, intelligent, ordinary everyday people, just like you! The cabins are all privately owned and you will often see other cabin owners out during the weekend enjoying the getaway from the stresses of the "other world" (the world outside of Holy Jim Canyon). How long have the cabins been out there? For decades. Many were originally built way before you were born. There were originally a hundred or so. Now there are about 48 left. Just their own. Most have propane for gas, a septic tank, a water tank or well, and many generate their own electricity through use of a generator or solar power. Many of the cabins do have hot water, a bath and shower, kitchens, refrigerators, etc. Just because they are remote, does not mean that they do not have comforts. How come the forest cabins do not have public utilities? Because they are in the National Forest. Can I have animals on the property, like a horse? No, but you can bring your dog while you're staying there. You cannot keep horses or other farm animals there. No, the cabins are in the National Forest, so the land belongs to the Federal Government. Is there a lease on the land? Sort of. You have to have a National Forest special usage permit. The permit is renewed every 20 years. This permit is renewed for any new owner, so you would generally get a new 20 year permit upon purchase. The land belongs to the Federal government, not the cabin owner. Could the Federal Government ask me to remove my cabin since it is on Federal land? What is the difference between the Holy Jim cabins, Upper Trabuco cabins, and Ortega cabins? 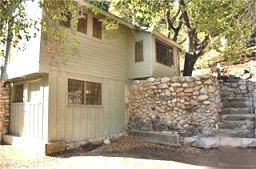 The Holy Jim and Trabuco cabins are accessed by driving up Trabuco Creek road, which is off of Live Oak Canyon road in Trabuco Canyon. Once you reach the large parking lot at about the 5 mile mark, the "Holy Jim" section of cabins are to the left, while the "Upper Trabuco" section of cabins are straight ahead. Ortega cabins are reached off of the Ortega Highway outside of San Juan Capistrano. Functionally they are all the same -- they are all located in the Cleveland National Forest and all info on this page applies. How far is the drive to get to the cabins? 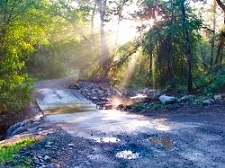 Trabuco Creek Rd is a dirt road and you will travel approximately 5 miles before reaching the first cabins. The first section of Trabuco Creek Rd is maintained by the County of Orange. This section is relatively flat, but it can also consist of a lot of washboard, sand, small stones, and a few mud puddles after it rains. You will reach a sign that says "Entering National Forest". This section is owned by the Federal government and it is much rougher than the County section. The road here narrows, and there are many stones, steep bumps, large mud puddles, etc. There are also a few concrete stream crossings (photo at right), These can become filled with moving water after a heavy rain so use caution. It is highly recommend that you take a vehicle with good ground clearance like an SUV or pickup truck. Do not take the family sedan! You may get stuck! Drive time at moderate speeds should be between 30 and 45 minutes. Do the cabins have a garage? Most do not but there may be a few that have a garage or carport structure. Am I allowed to add a garage? I don't believe you are allowed to, Nor are fences or many other additions allowed. The whole idea is to be "one with the forest" while you are recreating there. Check with the Forestry Dept to be sure on any of these questions. Can I repaint my cabin using a color of my choice? No, You must select one of the colors designated by the forest service. They can provide you with color samples and guidelines. How long am I allowed to stay there? There are certain guidelines with the Forestry dept. Informally however, you may stay there all you want. You just need to have a primary residence somewhere else..
Can I buy one and rent it out? Yes, but just for two weeks per year maximum. This is not a rental property, it is a recreational home for you and your family to enjoy as a "getaway" property. It can be legally rented to others for up to two weeks per year. Again, you also have to have a primary residence elsewhere in order to buy it. Could I live there inexpensively and commute to work everyday? I guess you could live there, as long as you have a primary residence elsewhere and can qualify for the forestry permit. Commute to work? If you have driven out there you will quickly find out how tough that would be! What about cell phone service? Internet? TV? There is no cell phone service out there. Too far out of range. What many cabin owners do is install a satellite dish. Wa-Lah! Technology! With a dish you would have access to television, phone service, and Internet (if you really must take your laptop with you). Can I see any of the properties? Only if you have been out to Holy Jim (or the Ortegas) yourself, AND if you are seriously considering buying it. It is very time consuming to go out there and it is down a very tough 5 mile dirt road, so I don't entertain "looky Loos" or people who want to see them out of curiosity. If you are familiar with the canyon and if it looks like something you might be seriously interested in, we'll make arrangements to take you out there and show you some of the cabins. Can I get bank financing? No, not directly. The cabins are not regular houses, they are classified as personal property so a bank won't finance them with a standard mortgage. They are cash-only purchases, although some owners may offer private financing. You may also be able to indirectly finance a cabin by taking out a loan on your primary home to finance a cash purchase. Do the cabins need work? Most of the cabins were originally built in 1930 or earlier. Many need on-going TLC and that's part of the deal (and fun) with owning a rustic forest cabin. If you're looking for "turn-key", don't come out to Holy Jim or to the National Forest -- we'll go look at some condos instead. Is there a web page for Holy Jim and Upper Trabuco that has photos and information on the cabins? I have a lot of other questions. Write to me. I can answer many more questions for you. I will also put you in touch with the local forest ranger who can provide you with a lot of additional information. The comments and information on this web page are the opinion of the author only. The information is believed to be true, but it is not guaranteed. Potential cabin buyers are advised to conduct their own investigation into all of the aspects of purchasing and owning a forestry cabin on government land. Contact officials from the US Forestry department for updates on policies and regulations for the ownership and maintenance of forestry cabins. Forest ranger number is 951-736-1811.